Haunting, in all the right ways. beauty and with a hint of nightmarish drone that makes you want to listen more. Her voice is at it peak and encompasses everything that needs to be in music right now. Abyss is a heavy and dark goth rock record. 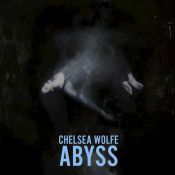 Chelsea Wolfe sounds really convincing and poignant at several spots in this record. The only drawback to this album is that her vocals can get murky and get trapped underneath all that is happening in the song. Otherwise I did enjoy this record.